Residence Inn Maui is the new keiki on the block in paradise. 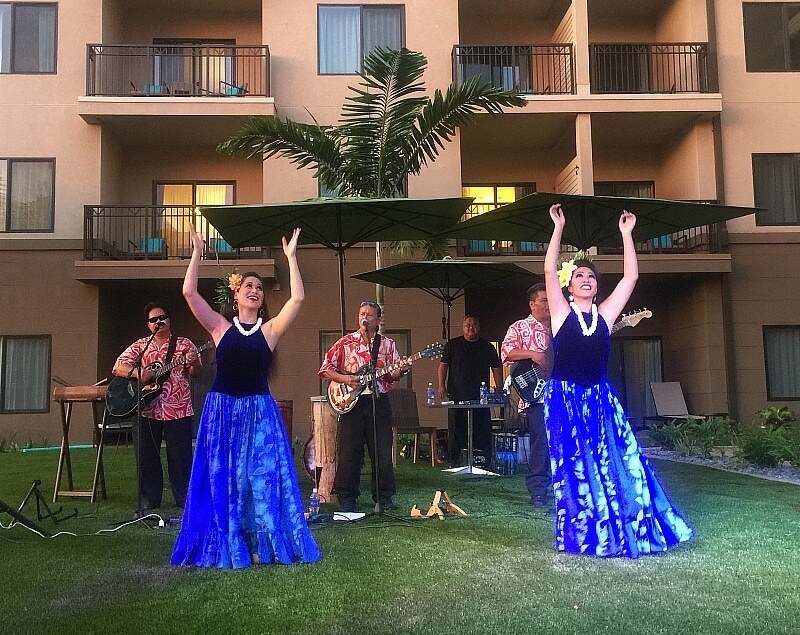 The all-suites Marriott brand kicked off its recent grand opening with a traditional Hawaiian conch shell call and luau. The initial party may be over but the fun lives on at Residence Inn Maui. There’s much for families to love at this new hotel in Wailea. All rooms at Residence Inn by Marriott hotels are suites. This means they come equipped with full kitchens stocked with a big fridge and freezer, coffee maker, dishwasher, sink, microwave, dishes, and cooking supplies. Sure, you want a break from cooking on vacation but a kitchen makes life so much easier, especially when traveling with kids. You can easily to whip together snacks or enjoy an occasional night in. Studio suites feature a pull-out sofa and either two queens or one king. For extra privacy, spring for a one-bedroom or two-bedroom suite, with a door separating the parents from the kids. 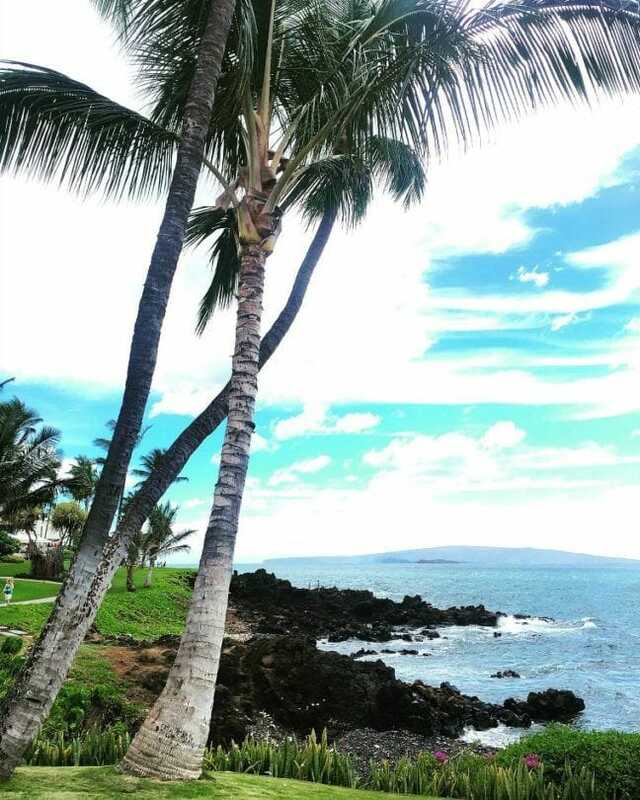 There’s no mistaking where you are during a stay at Residence Inn Maui. It feels Hawaiian indeed with its beachy decor and tropical colors. Just in case you forget, big windows and open-air spaces provide views of the pool, with the islands of Lanai and Molokai in the distance. All rooms at Residence Inn Maui feature a balcony or patio, making nap-time more pleasant for parents of babies and young children. Pool view rooms are the best, but even from my room that overlooked the parking lot, I could see the ocean and Molokai from the balcony. No trip to Hawaii would be complete without a swimming pool. 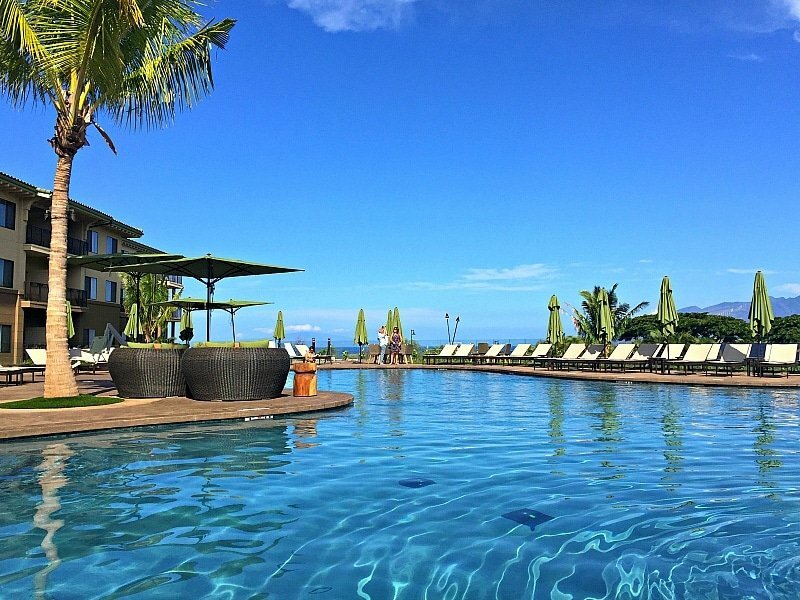 Thankfully Residence Inn Maui’s pool is a pretty one, with an ocean view and plenty of palm trees. A shallow settee is perfect for little ones, or sunbathing parents. Soak in the hot tub or pull up one of the many lounge chairs to read while the kids play. Pool towels are provided, of course. You can also buy sunscreen or rent snorkels, beach chairs and umbrellas from a poolside activity desk. Although Residence Inn Marriott is not located on the beach, it’s a short 4-minute drive or 23-minute walk away. Guests can take a complimentary shuttle anywhere within three miles of the hotel. The closest choice is Ulua Beach, near sister property Wailea Beach Marriott Resort & Spa. 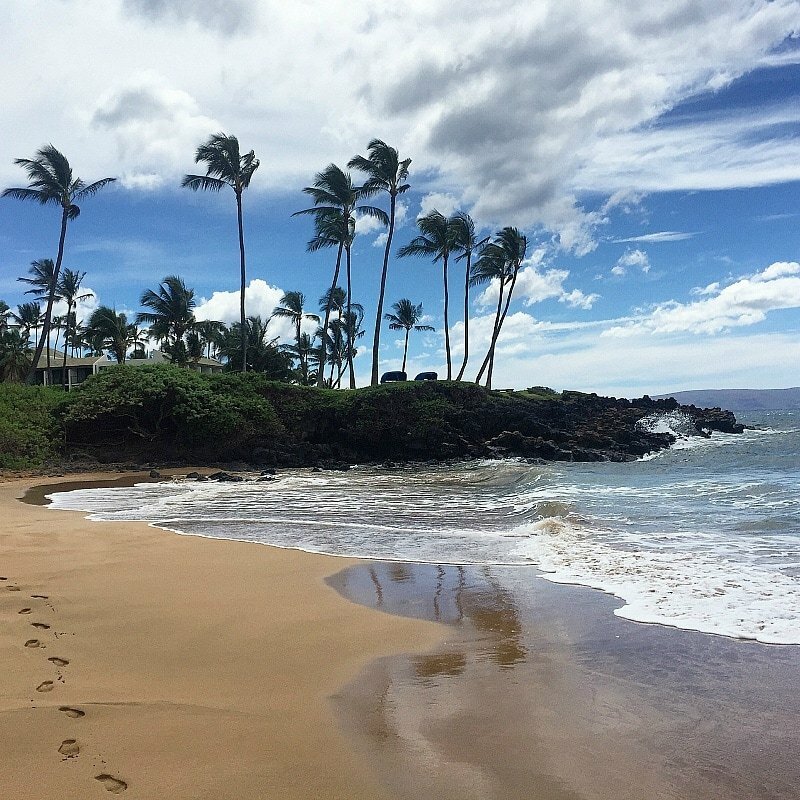 If traveling with little ones, choose Wailea Beach for its mellow waves. There’s plenty to do both at, and near, Residence Inn Maui. Burn off those extra vacation calories at the on-site modern fitness center. Staring at the hotel’s gorgeous pool while you use the cardio machines and free weights is great inspiration! If games are more your thing, there’s a basketball court and small putting green. At the poolside activity desk, you can sign up for water excursions (for additional fees), like a Kayak and Snorkel with Sea Turtles Tour. The concierge in the lobby is happy to arrange all sorts of Maui activities, like a road to Hana tour, helicopter rides, and much more. Included breakfast makes starting your day easy on your schedule and your bank account. 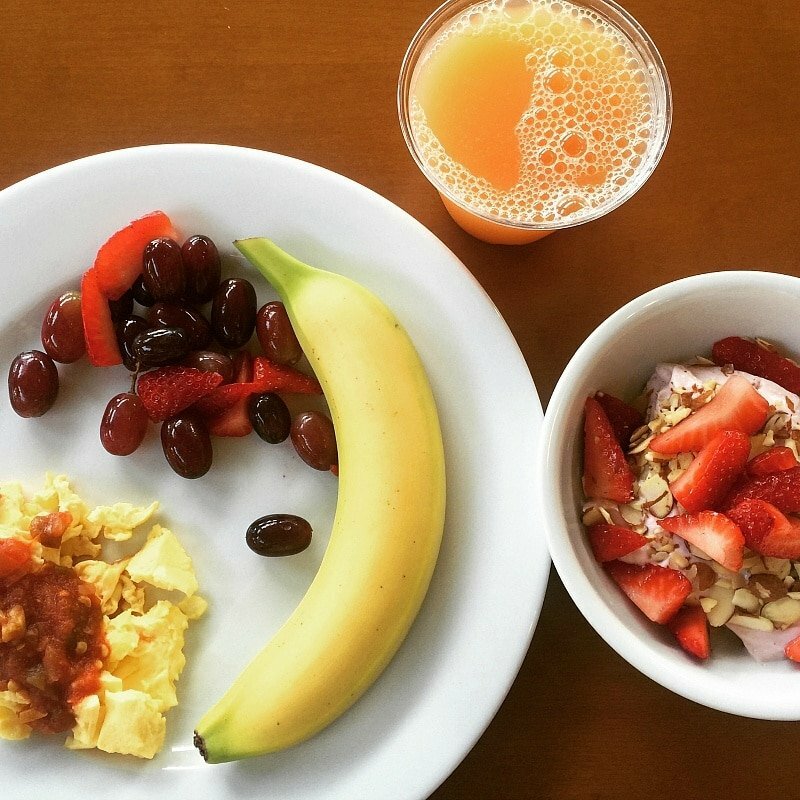 The Residence Inn Maui breakfast buffet offers scrambled eggs, two breakfast meat choices, yogurt, fresh fruit, cereals, and baked goodies. Quench your thirst with a selection of juices (like guava! ), coffee and tea. Kids will love the make-your-own waffles with fun toppings like chocolate chips, strawberry sauce and whipped cream. Although there is no full restaurant on-site, you can grab quick lunch and dinner fare like a chicken caesar salad from the bar at Residence Inn Maui. 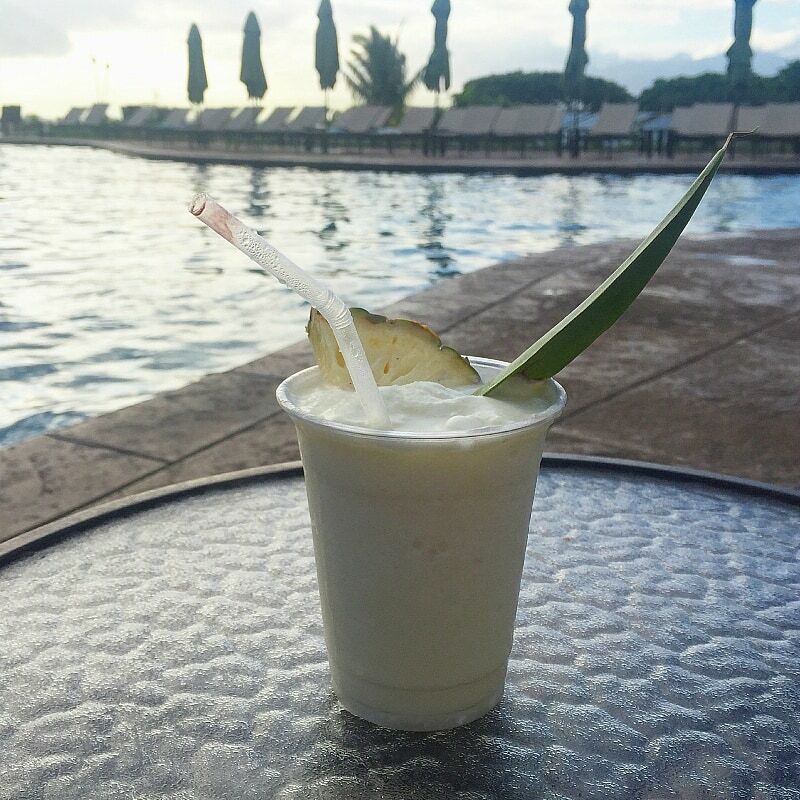 Be sure to order one of their delicious creamy pina coladas while you’re at it! It’s fun to grill out, especially with ocean views and a tropical beverage in-hand. 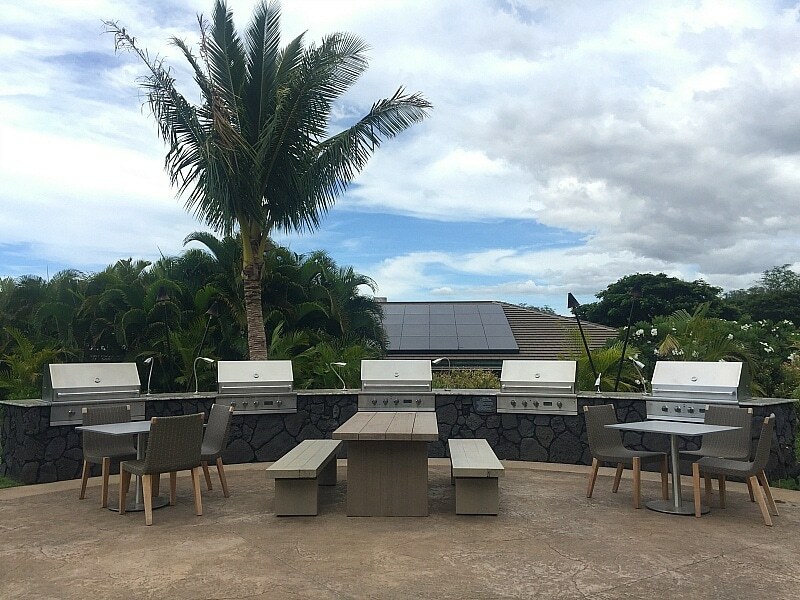 Residence Inn Maui has several barbecues on property for guests. Choose from an array of marinades for purchase at the hotel’s mini market. If you’re looking for something a bit more upscale, you can’t go wrong with a visit to Monkeypod Kitchen, just a few minutes walk from the hotel. Their signature Mai Tai is served with an impressive dollop of whipped honey-passion fruit foam. Even better is their macadamia nut-crusted mahi mahi. It was so good, in fact, that I visited twice during my three-night stay at Residence Inn Maui! For additional restaurant choices (like Ruth Chris Steakhouse and Nick’s Fishmarket Maui) plus shopping, reach the Shops at Wailea near Ulua Beach via the handy complimentary Residence Inn shuttle. Of course, parking is plentiful too, if you rent a car. Pick up snacks and souvenirs at Whalers General Store. Head to Maui Clothing Company or Blue Ginger Kids for unique Hawaiian duds to wear to a luau. For a swanky Maui souvenir, there’s Na Hoku, a traditional Hawaiian jeweler. There’s even an ukulele shop, Mele, if you want to bring the sounds of Hawaii home with you. Reward kids for their patience while their parents shop with a sweet treat from Lappert’s Hawaii Ice Cream & Coffee, or Surfing Monkey Hawaiian Shave Ice. Yum! Pricing at Residence Inn Maui Wailea is significantly lower than what you’ll find at beachfront resorts on the island. Booking longer stays can increase the discount, with savings up to 25 percent on stays 30 nights or longer. Plus, there’s no resort fee, unlike many Hawaiian hotels. Residence Inn by Marriott is a brand you know and can trust to provide high quality service and the extra touches. 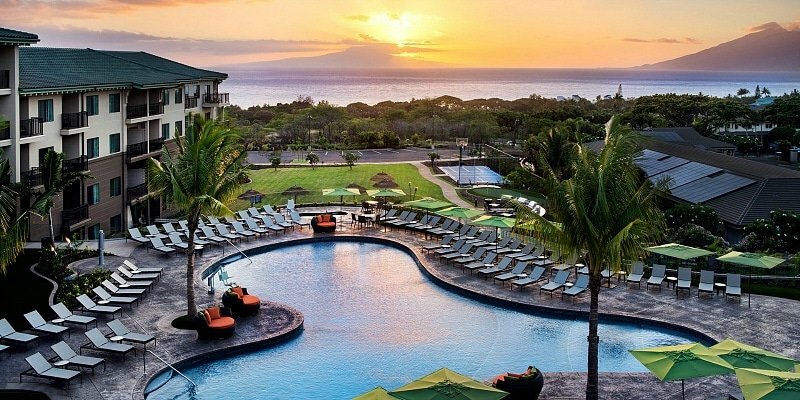 Meanwhile, you get a dreamy Maui vacation without the hefty resort price tag. Sounds like paradise to me! Read more about Residence Inn Maui on TripAdvisor and Hotels.com. 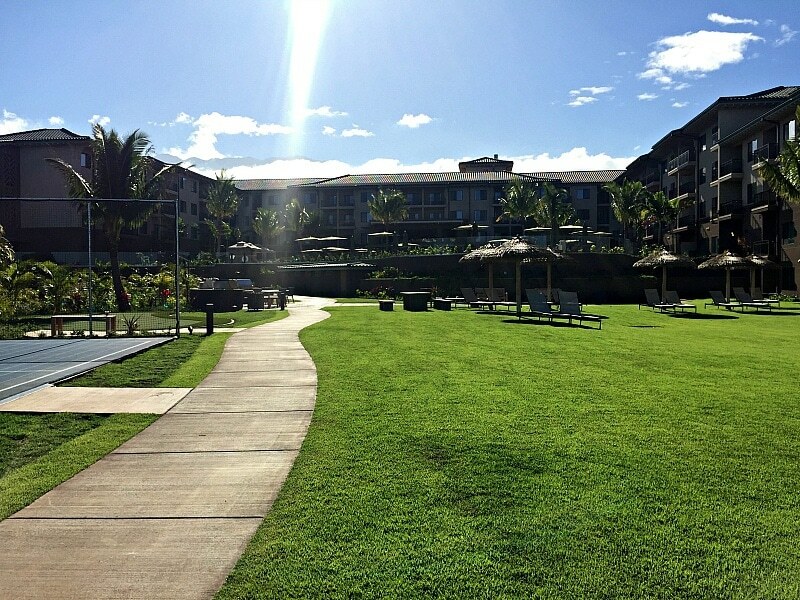 Would you consider staying at Residence Inn Maui? Do you have any questions about the hotel? Let us know in the comments below! 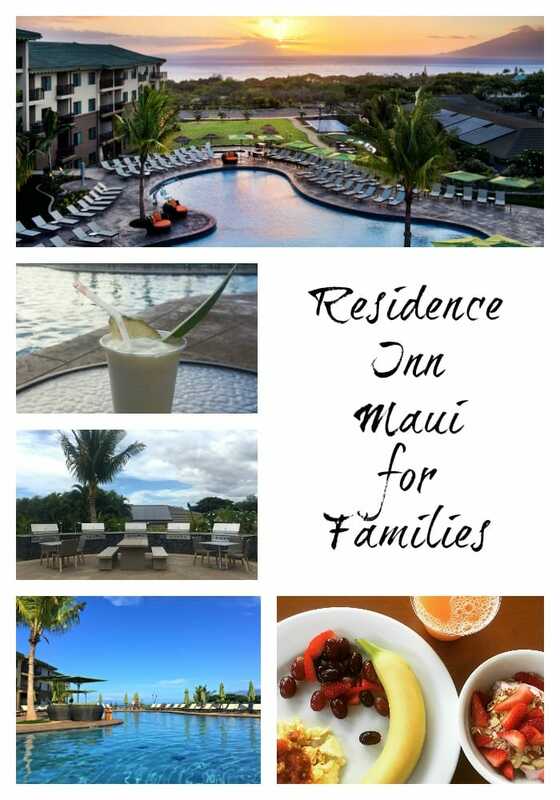 A Note from The Travel Mama: I was invited to experience Residence Inn Maui’s grand opening for the purpose of this review. All opinions are mine, as always. That is absolutely gorgeous! I could definitely use a couple of weeks there soaking up the food and the atmosphere. Wow. I bet your family would love it, Stacie! I really want to go back with my family someday. This looks like a wonderful place to stay. Maui is at the top of my bucket list for places to visit. Great bucket list destination! I have been to Maui five times and I love it a little bit more every time I visit. I would love to go to Hawaii! My husband would pick this hotel based on the free breakfast with stay. That’s great that they provide shuttle service too, which is always a selling point for me! Theresa – And with Uber and all of the excursions provided through the concierge and poolside activity desk, there’s really no reason to have to rent a car for a stay at this hotel. That’s a big saving right there! I love the pool, it’s so pretty! This looks like a great option for people who want to visit Hawaii! A good pool is so important – especially in Hawaii! I would love to go there! Looks soooo nice. I hope you get a chance to stay at the Residence Inn Maui someday soon, Tess! I have always wanted to visit Hawaii. I think the Residence Inn is a great place to stay when we make it over there! I hope you will get a chance to stay at the Residence Inn Maui someday soon, Kelly! Hawaii is pretty amazing, I’ve never been but I’ve always wanted to visit. Residence Inn is looking really wonderful, would be a beautiful place to stay! Yes, Hawaii + Residence Inn is a match made in paradise! What a beautiful place. I would imagine that no matter where you stay in Hawaii is going to be beautiful. Chrystal – It’s true that Hawaii is beautiful almost everywhere you go but it’s so much more enjoyable if you have a nice place to stay! What a wonderful place for staycation! I would to go there such a relaxing place. Oh! Do you live in Maui, OurFamilyWorld? Lucky!!! I love that every room is a suite. Can’t go wrong with any room you get, including the view. Agreed – I love all suites hotels! Veronica – It is pretty dreamy! I hope you get a chance to visit! My kids are dying to go to Hawaii. It’s been years since I’ve been, and the island is calling to me. The Residence Inn looks like the perfect play to stay while visiting. Maui is such a beautiful place and you can’t go wrong with staying at this lovely hotel! I think it’s the best place for a vacation! Agreed all the way around! I would love to go to Maui! Sounds like a dream come true for me. I hope your Maui dreams come true very soon! Hawaii has always intrigued me by the beautiful scenery and fresh air with special festivals!!!!! Hubbie and I just experienced our very first ever Residence Inn stay in Breckenridge Colorado. What an awesome stay we had! Our one bedroom suite was absolutely perfect and supplied everything needed for our stay. We travel about 25 weeks out of the year and I can promise you that Residence Inn will be our #1 choice from this point forward! How wonderful to hear that you and your husband had such a great experience with Residence Inn! I hope your travels take you to the Residence Inn Maui someday soon!